it seems very light and small so should easily fit in to my PDF pocket it's not bigger then an old school mobile phone really. As I mainly sail alone should provide a bit of back up in case things go pear shaped. Can anyone point me to a website that goes over the relevant procedure in using VHF it years since i did this sort of thing! some trainers offer a course inclusive of licence fee from about £80 - not sure who offers this in your area. Yeah, I should of said, I have all that, a certificate of competence in radio telephony (as if) from years ago as part of a coastal skipper course and a ship portable radio licence I got today online from ofcom. What I really want to clarify is this:They issued me with a 'T' number so in any communication with officaldom or god forbid a distress call do I use that number rather then the name of my vessel? This page on UKRGB is a good resource for all things VHF and relevant to paddlers. It sounds like you want to register your vessel on the CG66 scheme. You can fill in the form online. Last edited by Jon Wood; 6th-October-2011 at 06:15 PM. I bought this book and found it to be pretty good. It doesn't really answer the main question you posed, what to do with the T number in calls. I always figure I'd just use the model name of my canoe. Thankfully I've never needed to test it out to date. Shameful question to ask but what happens if you use one of these radios in an emergency but don't have the necessary license? Would you be rescued (if need be) and then fined afterwards? Cheers just ordered that on Amazon! Yes, you would be rescued and you may get procecuted afterwards but I guess the authorities may find this a little harsh way of dealing with you. The whole point of complying with the requirements, such as using recognised identification is so that the relevant authorities can easily find out who you are. Which I would suggest is quite important in a rescue situation. Those wanting to engage in Coastal Canoeing should consider adding their craft to Small Ships Register (Part III): this "provides an inexpensive, simple registration which proves the ships nationality (a kind of passport)". In UK waters, the CG66 scheme should be sufficient (though the SSR wouldn't hurt)... but CG66 allows you to enter your craft's Small Ships Registration Number: the two systems are complimentary. Advantages to the SSR might emerge if coastal canoeing elsewhere: I'm not aware of any BCU guidance, but the RYA has a very helpful page. The guidance notes say the new SSR application costs £25, with the registration being valid for 5 years: three months before your registration is due to expire, RSS will apparently send a renewal notice to the address you registered with them... but that must currently be accompanied by a further £25 fee. I have (and use) a marine VHF radio. I did the VHF one day course and the test at the end. Well worth a few quid for the training and also it gives you confidence to use the radio without making a complete Muppet of yourself. It also means you are legal! I have (and use) a marine VHF radio. I did the VHF one day course [....] Well worth a few quid for the training and also it gives you confidence to use the radio without making a complete Muppet of yourself. It also means you are legal! If you read the books you'll get the idea... but the course is short enough and harmless enough: probably worth anyone's time. It's not just VHF though: the course covers the "Global Maritime Distress and Safety System" (aka GMDSS). Given that's it's a one-off training and allows practise on training units.... I'd suggest it's generally pretty good value for money! I'd suggest it's generally pretty good value for money! UK regulations permit you to monitor the radio for safety purposes or to use it to request assistance in an emergency without a Certificate of Competence and Authority to Operate. I wouldn't bank on it being waterproof! In fact, I'd say that it's water resistant at it very best! There is only one off the shelf product that IS waterproof and that's a Rolex watch! These don't seem very versatile though, you either activate them and send out a distress signal... or you don't. As it is a portable radio and not a ship radio you use the 'T' number as your call sign, then inform the coastguard of the type of craft you are. After all it may be someone else in need of help that you come across but can not physically do due the size of your canoe/kayak or situation. Getting a refresher on how to use it and a licence would help with your actions should something go pear shaped, it needs to be almost instinctive an action to be an efficient call. The RYA run courses all over and the ones I have done under their banner have all been worthwhile and fun to do. Do not rely on the radio alone, pack flares if going to sea and keep an eye on their expiry dates. Epirbs are great but do not allow for a listening watch, coastguard updates and admonishing the skipper of the fishing boat who was too preoccupied with his super strength lager to see you ahead ( the last one may come back and bite you legally if you do not have a licence though). Its the icom m33 that has the battery terminal issue. However, I have had my m33 for nearly two years and its as good as new, reason being I slip it into an aquapac whilst on the water as a secondary defence against the alleged 'waterproof' claim! If doing a course on VHF radios means that you don't use "over and out", it's money well spent! Good to know Steve, thanks. 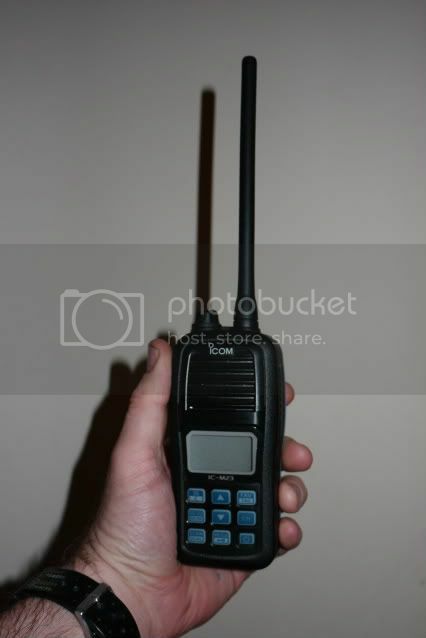 I'm hoping to buy a VHF and do the course this winter and that raises the inevitable question of which radio to get. The icom ones seem to have the best reputation amongst yachties/dinghy sailers but the m33 seems to have tarnished this a little amongst sea kayakers. It seems that other models (such as the m71) are still rated though. The complaints seem to relate solely to the corrosion problem on the m33 so an aquapac could be the answer for that model. the m23 has a sealed jack point next to the antenna at the top of the radio, (it looks like a volume knob) you undo that in dry conditions and connect the charge cable. Time will tell how reliable it is but I can't find any problems reported on the internets on this model. the VHF is good to have , but its range can be limiting , a PLB is the beter for emergancies as its satalite driven , cariying both is what I do, for sea kayaking , I only cary the PLB on river/walking trips. Can I ask if it is possible to use a VHF radio for general chatting to other sailors while out together or must the band width be kept free for genuine emergencies? The reason I ask is that I feel that it would be useful to communicate freely with other canoe sailors with stuff like: "I'm heading over to the other more sheltered side of the water, you coming with me?" or "Can we head back now, I'm taking on a little too much water" or "Lets not go out too far before lunch and head back this way later when there are more of us" or "I'm struggling to keep up with you guys, can we stay together please" etc. etc. As apposed to stuff like: "God that curry we last night has gone right through me, so try and stay upwind of me, lol!" or "What was that joke he told us last night?" or "What's your favourite sail colour?" etc. etc. It would be a shame if the only thing you can use VHF radios for is: "Help, I'm in trouble, call 999 someone please!" Are there seperate channels like CB radio where everyone going out can choose a chat channel for whatever they want to chat about, with an emergency channel that everyone will hear if there is a major problem? Anyone done the courses or have experience of VHF radios know what is allowed? Yes you can use it to communicate with fellow boaters but if that's all you wanted it for then a couple of cheapo PMR walkie talkies that are readily available would be a more financially viable option (i.e. cheap to buy, could be easily waterproofed in an aquapac and no course/licence required). We sometimes use PMR radios when backcountry snowboarding to communicate about safe lines to ride, where to meet up etc, they're quite handy and have decent range within line of sight (it's not unusual to be able to talk to people a couple of miles away as the crow flies). Marine VHF is used by Coastguard, shipping, Marine Police etc as well as leisure boaters so is altogether more "formal". or alternatively you can just nominate a chanel to be on , depending on your location diferant chanels are alocated to diferant youses , comershal fishing , sport and rec youses ports and harbours ect..
we never cary out a convisation on 16 , always cal up and nominate another chanel to go to , then ther are the repeter chanels , and the coast gard also youse VHF for wether forcasts, thay brordcast that ther will be a forcast , and which chanel it will be on .then you change chanel to lisen , ater words you go back to 16 to lisen . 16 is also wher you hear/ brordcast your destress calls. Then the risk is that everyone else that turns up, will have a different radio on different frequencies and the only person that can hear you is the other person with exactly the same model radio! If it is possible to pick a channel on the VHF system for everyone to chat to their hearts content and it has the added safety feature of an emergency channel monitored by the coast guard and the Wessex helicoptor that flies over to help later, then this is the system to go for I think. Your conclusion is very much what I would recommend. Although constant inane chat is not really what any VHF channel should be used for, the kind of group communications you mention above is absolutely what one of the ship-to-ship channels is for. We in the OCSG have adopted 08 as our standard, but if someone else is using it then you need to change to another. The license-free PMR radios all use the same channels so even if you have different brands/models that is not a problem - but they are not as robust or waterproof, generally (you can get "professional" ones but they are just as costly as marine VHF ones so no point). Also VHFs have dual monitoring so you can have it set to your working channel (eg 08) but still be able to hear Ch16 for other calls, emergencies. The coastguard broadcasts the weather every 3 hours as well. Last edited by windorpaddle; 17th-October-2011 at 09:47 AM. I still intend to get a VHF and qualification this winter but that's because I aspire to do more sailing on the sea. If I was confining myself to inland water I wouldn't bother. The reason I would still go for a VHF radio then, even if I had no intention of going out to sea is that you would only have a VHF radio when we meet up at a meet somewhere inland. If I went for a cheaper radio, I would have no one to communicate with. On the basis that some people would only have a VHF radio, isn't it better to say to everyone thinking of buying a radio, buy VHF because that's what most people will have. Just to say that Tony & myself took the VHF Radio (DSC) course yesterday at Rutland Water and both passed. Licences now applied for. If I was confining myself to inland water I wouldn't bother. BTW, we were talking to the safety boat team and they are encouraging all sailors to get a handheld VHF radio and the training. While they will get 3 or 4 ribs on the water, at times there are hundreds of boats on the water at the same time and they can't see everyone all of the time. Being able to call for help is better than hoping someone has seen you and has a radio to report it. Last edited by Steamerpoint; 23rd-April-2012 at 11:27 AM. Well done Chris - and Tony! Good to know that Rutland Safety are keen for VHF to be used - makes sense and good practice/familiarity for us. 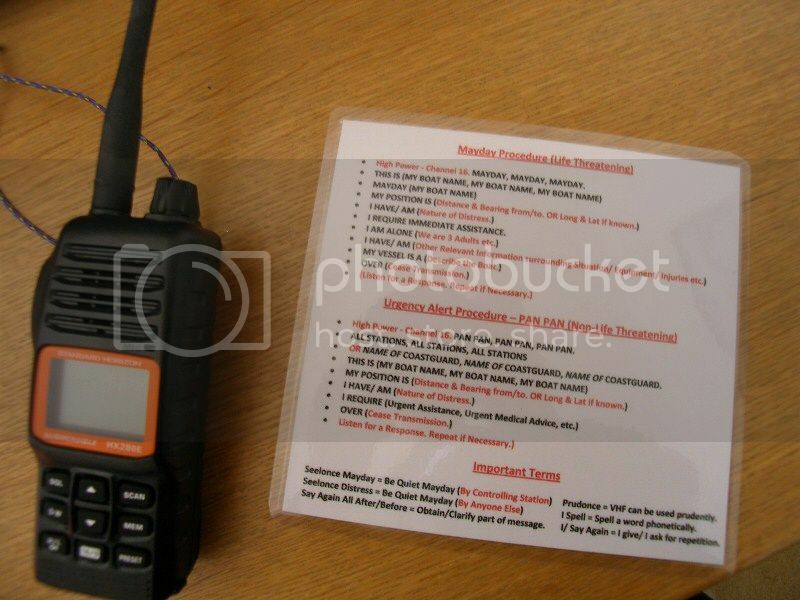 By the way, I forgot to mention that I took Gavin's idea of a laminated card and made something up that would help me remember the VHF course and is smaller (Double sided) which I can easily take with me in a pocket/ drybag. The OCSG sheet I will leave in the car as a checklist before I set off as it is great memory jogger and does cover the Mayday procedure and the standard radio procedure, but I made this sheet to help remind me of things like the Pan Pan Urgency Alert procedure, the Mayday Relay procedure, Important Terms like Seelonce & Prudonce etc. plus the standard channel allocations like port operations, marina operations, sailing clubs, coastguard and spare channels we can use. I just figured that I should capture the things I should try to remember while it is still fresh in my mind. That's a good idea and one I was planning to do myself. It'd be handy for briefing anyone who went out for a sail in the canoe with you as well in case something happened to you, a kind of idiots guide to how to make an emergency call. My friend whose yacht I've sometimes crewed on has something similar by the vhf on the boat in case he takes a header over the side and one of the crew has to make the call. I love the way your meant to pronounce the numbers in the phonetic alphabet, WUN, TREE, FOWER, NINER ! In fact some of the letters are pronounced oddly, HOH TELL, KEH BECK!! Looks like we're all thinking along the same lines re a reminder card. I did one a few weeks ago and shared it with some group members for their suggestions but hadn't got round to production yet. My plan is for pocket size and double-sided. I can print and laminate them at work for group members needing one. The only problem now with the older vhf radios i.e the ones without dsc is that the coastguard no longer listen in to channel 16. I thought they still did, but just not with a dedicated radio operator, they listen in an open environment in the ops room. Yeah they still monitor 16. There are very few handheld radios with DSC still (just two afaik) and they suffer from poor battery life. DSC handhelds will probably be great in about five years time. Roy, the coast guard very much use channel 16. I'm not sure if handheld radios have DSC if I'm honest. Some may have, but we weren't shown any. The course must teach DSC now, but I doubt I'll be using it again for many years to come. I found DSC a little too fiddly if I'm honest. While you can just hit the "Distress" button and it will transmit your MMSI number saying who you are and your location if it has GPS in it/ connected to GPS, you still need to send a distress message on channel 16 to advise of your mayday call. Sure you can go into the menu settings to state an indication of your emergency (I.e. Fire, sinking etc.) before you hit the red "Distress" button, but I'm not sure you will have time. I like the way that you can page a friend and take him to another channel for a chat, but if your radio has "Dual Watch" as ours does, you can call them on 16 or a spare channel anyway as long as to pre-agree to communicate on the two channels at some point. DSC is good, but I'm not sure is solves everything. A kind of simple pager that can tell people you know to go to another channel and no one else knows you have done it. I'm not sure if handheld radios have DSC if I'm honest. Some may have, but we weren't shown any. This has been an option in the US and elsewhere for some time... but up until recently, such sets were not legal over here. Now the rules have changed... so the world can finally move on! I got my Icom M71 under the misconception that DSC on handhelds was many years away. Had I known the rule change was imminent, I'd have waited. DSC is VERY well established on fixed devices: I'm pretty sure that before long, it will also be ubiquitous in the handheld market. Ps. That said... I've also seen the concerns about battery life that Chris has highlighted. One to watch. I've just bought a Standard Horizon HX851. It has DSC with GPS. It's incredibly easy to use and is a great step forward in marine safety. I'm getting 9 hours plus of battery life which is enough for a day trip. I have no doubts that DSC is the future and I was tempted by the HX851 but it was the fact that I could expect almost double the battery life with a non DSC model that swayed me against them. As I understand it the Mayday signal is sent as a data burst when you push the button on the DSC radios and as such has a better chance of getting through than a voice transmission (which is why the spoken Mayday is sent as a follow up). The DSC signal also gives your location as a GPS fix automatically which is great. One of the big draw backs with a handheld is the limited range when the aerial is down at sea level so anything that effectively increases that range (such as the DSC transmission) has to be a good thing. You can get a similar effect with a mobile phone which will send a text message perfectly with a very weak signal but won't allow you to make a voice call. I decided to go with a non DSC radio for now (due to the battery issue) but I'll look again in a few years time. In the meantime I intend to buy a PLB as another line of defence when I can afford it (I could have bought an HX851 for less than the combined cost of a non DSC radio and a PLB so my decision wasn't budget led). I registered my radio with Ofcom yesterday (https://services.ofcom.org.uk/), it's a very simple and quick process and means I'm fully legal to use my radio. I wasn't going to bother with the ship portable radio licence as it is no longer policed and I don't need an MMSI number for a non-DSC radio, but not having to look into where I should get one, you made it too easy Chris and decided to just do it! If for nothing else, they have my Next Of Kin details on record.